148Apps recently treated us to a fancy pie chart in Apple iTunes App Store Metrics, Statistics and Numbers for iPhone Apps which demonstrated how easy it is, if you’re not satisfies with how much a 3D pie chart can distort data, to add extra distortion. If ever there was a job for Chart Busters, this is it. 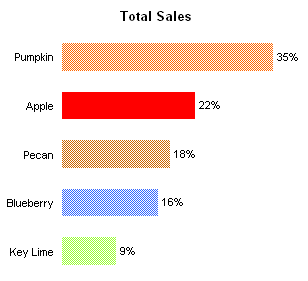 I originally learned about this exciting chart from Alex Kerin, in Pareto lines on bar charts – an Excel fudge. 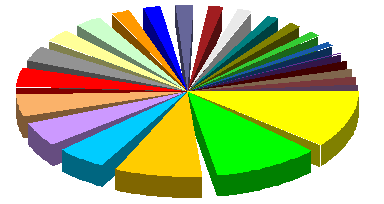 In all of its glory, here is the original 3D not-quite-exploded pie chart. What’s wrong with this chart? Well, it’s a pie, and we’ve covered this ineffective visualization method before. It’s rendered in 3D, which through the magic of simulated parallax distorts the apparent sizes of the data points (i.e., the wedges). Also the legend is truncated: the last three items are left off the bottom. They’re each only 0% of the total, but you can see paper-thin wedges struggling to remain upright in the pie. In a few moments I’ll describe the larger visualization sin. But first I’ll try to duplicate this same chart. 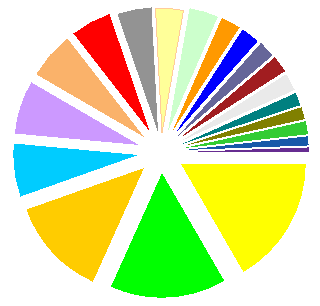 I pasted the data into Excel, made a 3D pie, and adjusted the colors and orientation until I had gotten pretty close to the original. I’ve managed to include all of the legend entries. But my chart doesn’t resemble the original very closely, does it? What if we explode the pie? It still doesn’t resemble the original. When I exploded the pie, the wedges moved outwards by the same amount. The edges that were at first touching are still parallel, and the angles at the vertices of the wedges are unchanged. The original pie, on the other hand, has its wedges still touching in the center. The gaps themselves are wedge-shaped, which decreases the angles of all of the pie’s wedges and distorts our decoding of the underlying values. I guess this is what happens when there is too much art, too much aesthetics, involved in the graphing of data. 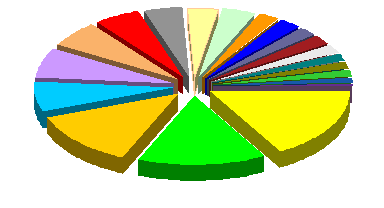 Let’s start with plain vanilla pie charts of the data, in both 2D and 3D. I’ve omitted the legend and labels for clarity. If we do a straightforward explosion, the shapes of the wedges are unchanged. The gaps are not uniform in width, but are larger between wedges with larger values. 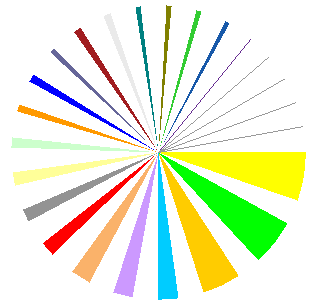 There is also some kind of optical illusion going on in the center of at least the 2D chart. We can recreate the appearance of the original chart by inserting an invisible wedge with value 2500 (I fiddled to get this to look about right) between every pair of adjacent wedges in the first chart, without exploding the chart. 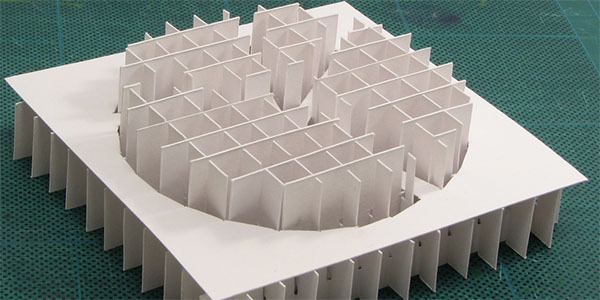 All the gaps are the same width, and some of the real wedges are smaller than the gaps. This proves the maxim, “Less is More”. 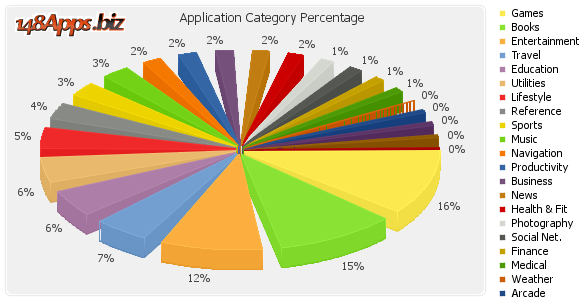 The 3D pie closely matches the appearance of the original 148Apps chart. you can take this approach to extremes. With ultra-wide wedges, there isn’t too much differentiation between the data values. We can take this one step further, by moving all of the gaps to the “end” of the pie. 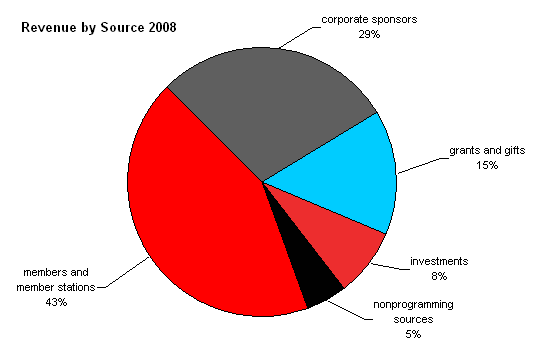 This clearly illustrates the distortion of the fancy wedge-gapped 3D pie chart. 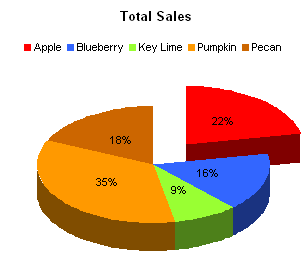 The amount of these pies that are made up of nothing is 31%, leaving only 69% for displaying data. 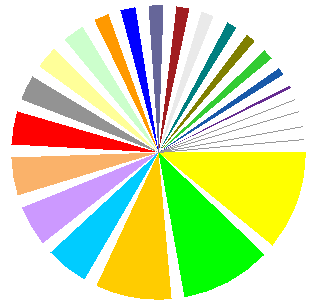 The largest wedge, which comprises 17% of the data, fills only 11% of the circle. We humans are bad enough at judging areas and angles, so when the angles are distorted in this way, we’re hopeless. Posted: Friday, February 5th, 2010 under Chart Busters. My friend Debra Dalgleish notified me the other day that it was National Pie Day. 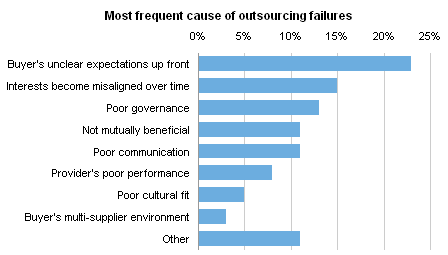 I missed National Pie Day, but while reading The Real Reason Outsourcing Continues To Fail, I encountered a pie chart that gave me indigestion. 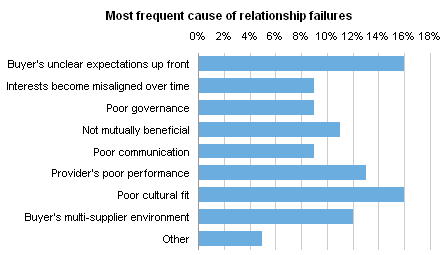 It purports to show problems with inter-cultural relationships that lead to outsourcing failures. What’s wrong with the chart? 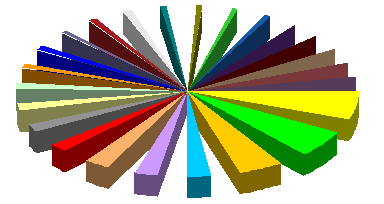 It’s a 3D pie chart, and we’re looking at it almost end on, so the sizes and angles are all distorted. 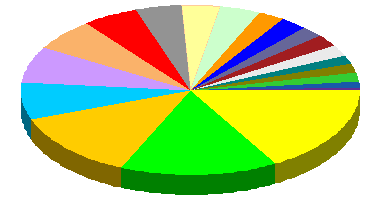 The values are unsorted, so position around the pie doesn’t help determine relative percentages. The legend is ordered by row instead of by column, so you have to go back and forth between the pie and the legend, then back and forth between the two columns of legend entries, then if you remember, back to the pie. 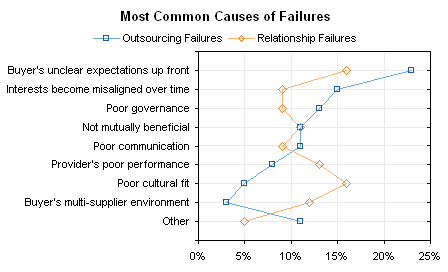 When I visited the original report that contained this chart, What Causes Outsourcing Failures?, the reason for the unsorted values became clear. 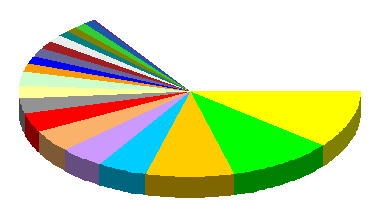 Figure 1, earlier in the report, showed its slices sorted by value. Because of the severe angle you can only tell the chart is sorted because the data labels are in numerical order. Placing “Other” in the middle of the data is unorthodox. Generally “Other” is placed at the end, because typically it’s comprised of several very small values. Figure 3 used the same order as Figure 1, except that “Other” was placed at the end where it belongs. This consistency is not a bad thing, but it’s dwarfed by the other problems with the charts. 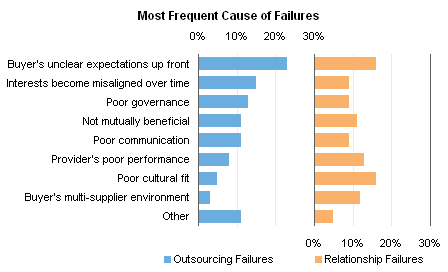 There is another pie chart, Figure 2, which shows Least Frequent Causes of Outsourcing Failure. I’ll spare a kitten and not repost it here. How can we make these charts better? Let’s dispense with the 3D distortion. The circular arrangement also does not aid in understanding, especially in the unsorted Figure 3. Let’s remove the legend and put the labels right next to the points. This way, we can reduce the number of colors (which I haven’t mentioned, since it often boils down to a matter of taste). Well, that sounds to me like a bar chart, so here are bar charts of the two pies above, Figure 1 above and Figure 3 below. Easy to read, easy to correlate label with data point, easy to see a strong variation in Figure 1 but not in Figure 3. But they take up a bit of room, don’t they? Let’s see how they look in a panel chart. That’s good to compare the general shapes of the trends. If we’re concerned with the specific values of each category, we can even plot the data in the same space with a dot plot. Posted: Wednesday, January 27th, 2010 under Chart Busters. 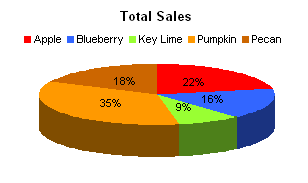 Tags: 3D Pie Charts, Pie Charts. This post was inspired by Moving a Pie Slice, a recent post on Patricia the Excel Diva’s Chatting about Excel blog. Patricia presents a few helpful Excel tips each week. 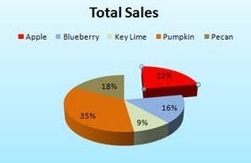 In Moving a Pie Slice, Patricia shows how to explode one pie segment out of the pie chart. I’ll review the protocol, not because I want all you Chart-Busters-in-Training to start making these charts, but just for completeness. Then I’ll present an alternative way to show the data. 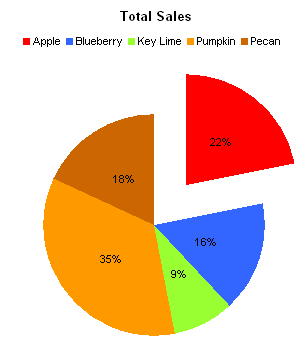 Here’s Patricia’s chart, which she claims describes sales of different pies in the days leading up to Thanksgiving, but which I think indicates the relative risk of me exploding from eating too much of each type of pie. For our non-US friends, I’ll simply say that Thanksgiving is a celebration of abundance, and often celebrants overindulge themselves. 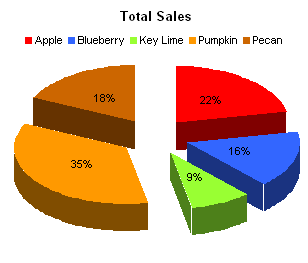 I used Patricia’s numbers and created a 3D pie chart in Excel 2003. The tilt on that sucker is ridiculous, so I backed it off some. 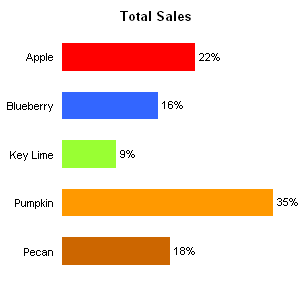 It’s still 3D, so there’s some distortion (note how much larger the 16% Blueberry s than the 18% Pecan slice). If you right click on a 3D chart, there’s an item called 3D View which opens a dialog that lets you adjust the vantage point. To explode just one individual slice of the pie, click once on the slice (not the label) to select the pie, then click on it once more to select just the slice. 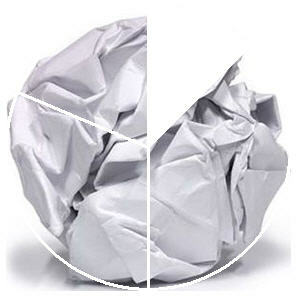 Now click and drag the segment away from the center. If desired you can now select another individual slice of pie and drag it away from the center of the pie. To explode all slices by the same amount, just click once on any slice, and drag outward. Let’s step back for a moment and let this chart remind us why we don’t like 3D Pie Charts. See the brown slice? It’s a lot bigger than the blue slice, isn’t it? But the values are very close, 18% vs. 16%. The chart exaggerates this difference. 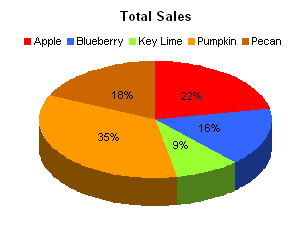 And here is the 2D version of a pie chart with one piece dragged away. In my role as Chart Buster, it is my duty to show an alternate chart style which makes comparison of the data easier. We’ll use a classic bar chart. Data points (bars) in a bar chart are easier to compare, because they share a common baseline: the left edge of the chart. We can also dispense with the legend, because the category labels are located immediately adjacent to the bars. No need to look back and forth between the legend and the data. The first thing to do with this chart is to sort its data range, in decreasing order so the largest bar is at the top. Note the comparison between the brown and blue bars. 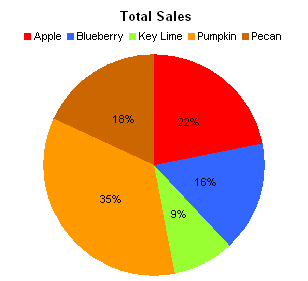 You can tell that Pecan is slightly larger than Blueberry. The difference is greater than if you’d guessed using the 2D pie chart, but much less than if you’d guessed using the 3D version. Yet here you know the score without having to guess. If you’re using Excel 2007 and you can’t find the fill pattern dialog, don’t fret. Microsoft left them out of the Excel 2007 user interface, but kept them in the VBA object model, so patterns can still be applied. If you don’t feel like programming patterns for all the bars, my colleague Andy Pope has written a Fill Patterns Add-In for Excel 2007. It’s free, so download and install it. All of this futzing with colors is unnecessary. One benefit of bar charts over pie charts is that we need not rely on colors or patterns to help distinguish one data point from another. 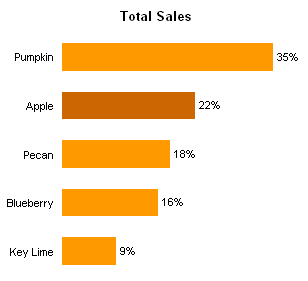 I’ve decided to pick a light orange-brown for my bars, and a darker brown for the highlighted data point. 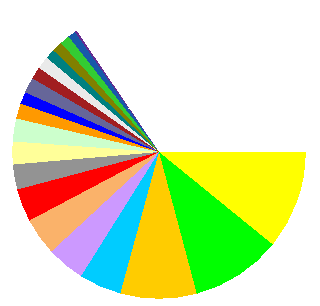 It doesn’t match the pie contents as aesthetically as the pie chart’s color fills, but the light and dark hues will survive photocopying in black and white, and we don’t have to worry about bad video settings or misinterpretation by colorblind viewers. 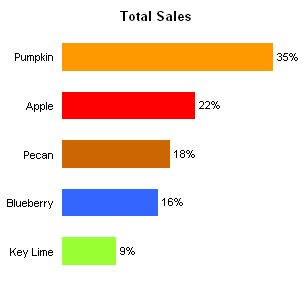 Yet another benefit of a bar chart is that you can make it rather small without sacrificing detail. You can construct an information-dense dashboard with arrays of small charts like this. Posted: Wednesday, November 25th, 2009 under Chart Types. Tags: 3D Pie Charts, Bar Charts. Last spring, FastCompany published an analysis of National Public Radio, which has taken off in the past decade. Will NPR Save the News? discussed NPR’s revenues and compared its audience with that of two other major news outlets, newspapers and television news. Yeah, NPR is great and all, I even listen occasionally. But this is a Chart Busters column, so I’m going to talk about the visualizations that accompanied the FastCompany article. Specifically I want to draw attention to the following two graphs. Look at the first graph: it’s a pie chart, in 3D, not only exploded, but with the pieces rearranged. At least they’re in order, but how are we supposed to interpret it? You could put the pie back together, and take a bird’s eye view. Yeah, not much better, but at least we’re not distracted by the thickness. The pie isn’t really much different than a set of labels. Here is the misaligned non-tabular table that results when we hide the pie pieces. Time to revert to an old standby. 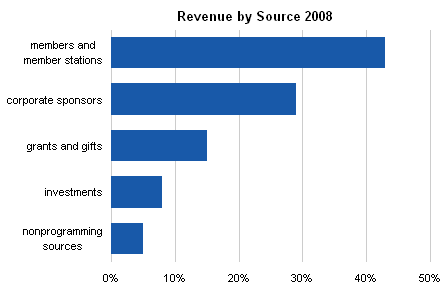 This bar chart clearly shows the relationships between the five revenue sources, and if we look very carefully at the Y axis labels, we see that they are formatted as percentages, so it’s no huge jump to realize they all add to 100%. The revenue data isn’t all that fascinating, but the audience statistics tell an interesting tale. The second FastCompany graph is another 3D wonder, a bar chart rendered in isometric view. The angles make the bar comparisons difficult, and also make the labels less readable than if they’d been printed straight. And in fact, the use of huge bars for percent change in audience takes away any analysis of audience size itself, which is an interesting variable in its own right. Let’s compare the audience sizes. 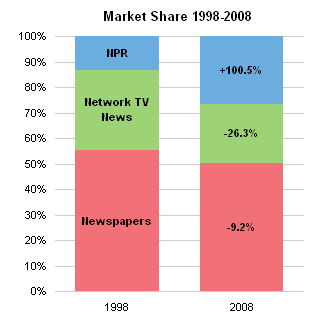 In this line chart we can tell at a glance that NPR as increased greatly, while TV and newspapers have gone down. This stacked bar doesn’t show the relative audience sizes as clearly, but it shows that the overall audience has declined a bit, and we can still tell that NPR’s audience has nearly doubled. We can compare share of the market, that is, share of the total audience. Again, in this line chart, the trend over the past decade is clear. 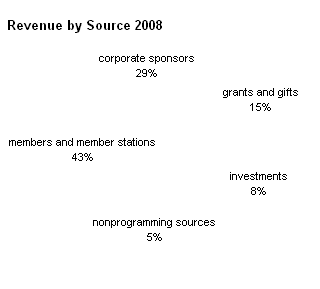 NPR’s share has doubled at the expense of newspapers and especially television. 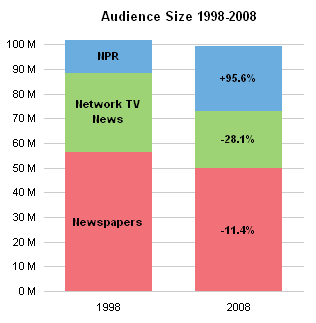 A stacked bar chart of audience share shows much the same trend. There are obviously more than three sources for news. Newspapers and television stations have web sites, and there are numerous blogs reporting news. I would think overall that the audience is much greater than the approximate 100 million shown in my first line chart. The decline in television news is not surprising, and I’m sure the television outlets are not too worried. They have plenty of so-called reality programming now, which is cheap to produce and generates huge advertising revenues. 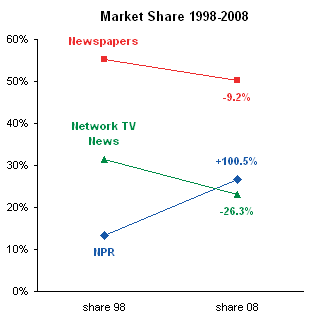 From all of the gloom and doom stories, I would hve expected to see a much greater decline in newspaper audience. 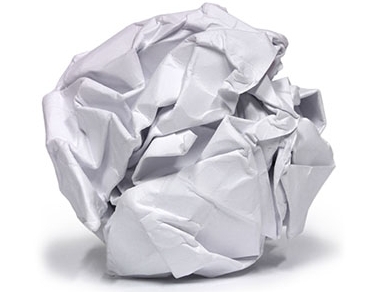 I no longer get a daily paper, and in many cities, the number of major papers has declined. If we re-examine these numbers in five years, we may see another 11% drop in newspaper audiences. Posted: Friday, September 11th, 2009 under Chart Busters. 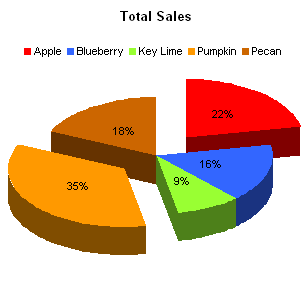 Tags: 3D charts, 3D Pie Charts, Pie Chart. 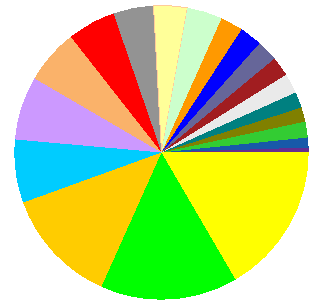 In Paper-Based Pie Chart Graphs, the information aesthetics blog shows a pie chart that isn’t printed on paper, but is actually fabricated out of paper. It came from Paper Graphs, on Nicholas O’Leary‘s knolleary blog. This seems to be more a work of art than a chart, so maybe it’s okay. But I get the idea that information aesthetics is taking this rather seriously as a useful way to display data. A 2D chart is ineffective enough for conveying informtion, and a pseudo 3D chart on a flat display (or a printed page) exaggerates the ineffectiveness. This sculpture can only be worse. So information aesthetics is hosting a contest to find the best information display based on, but not printed on, paper. They chose this picture the headline the post announcing the contest. Posted: Tuesday, February 3rd, 2009 under Amusement. Tags: 3D Pie Charts, Bad Charts.